ARP, UDP, TCP, ICMP, HTTP, DHCP protocols supported. The adapter turns a serial device into remote connected ethernet client. RS-422/485 - signal levels meet or exceed the Recommended Standards. The RS-232C side mates directly with a PC serial port. This makes the adapters an ideal solution for connecting external RS-485/422 equipment to operate as a client of your network. 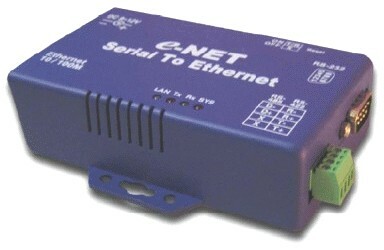 The adapter acts as a remote RS-232C and/or RS-485/422 device on an ethernet. No specific software modifications are required to operate with off-the-shelf applications that use the serial communications port for I/O. The user sets the included virtual serial device driver up on a PC then selects what comport to control to match the application software for the attached serial device during the setup process. In RS-485 mode, the data direction is changed on the adapter automatically. Shipped ready for installation. Setup is performed with a web browser (no jumpers to set) and a user's manual is included on disk.